The Japanese islands stretch for 3000 kilometres and so an extensive array of weather conditions prevails. 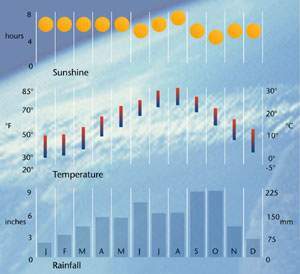 Tokyo enjoys temperate to subtropical conditions for the most part and has four seasons. Spring, from April to May, is the time when the famous peach, plum and cherry blossoms appear. Summer is from June to August and in this season the city can be hot, humid and experience rain. Autumn is from September to early November and is when typhoons can bring strong winds and torrential rain. Winter is from late November to March and is not severe. Tokyo enjoys relatively mild winters with low humidity and occasional snow.